Matt first posted back in August on the story of an 8-foot alligator that was found in Lake Machado in the Harbor City area of Los Angeles. It was obviously a released pet, and was a two-week media sensation in the city. People came out to the 54 acre lake to try to see the animal and enterprizing folks sold “I saw the gator” t-shirts and it was a real circus. The attempts to catch this critter have been an amusing comedy of errors and I regret now not having turned it into a running series here. First the City of Los Angeles hired a team of “gator wranglers” from Colorado (I know, so many alligators live there!) who thrashed around for two weeks, apparently spending more time trying to put a movie deal together than catch the gator. They failed, left town saying they would be back in a couple of weeks, and never returned. In September, a ex-police officer admitted that the alligator was his pet that he had released into the lake, and that the animal’s name was Reggie. So at least now we knew what to call him. Shortly after this, a second alligator appeared in Lake Machado. This fellow was only 2-3 feet long and promptly dubbed Little Reggie. It didn’t take long for a group of firemen to catch Little Reggie in a net and his fifteen minutes of fame were over. In October, the City hired a second team of gator wranglers from Florida. You would think these folks had a better chance of knowing their business. They also flailed around accomplishing little for a couple of weeks. In the meantime, of course, Hurricane Katrina had hit, and a number of Louisiana evacuees came to Los Angeles in her wake. City Councilwoman (publicity hound) Janice Hahn showed up at lakeside, TV cameras in tow, with a Louisiana evacuee gentlemen who claimed to be an expert at gator trapping. She said that this would be a great opportunity to help an unfortunate unemployed displaced man find a job and wanted the City to use him. This fellow observed the Florida wranglers efforts and promptly pronounced their methods “retarded.” The Florida people had their feelings hurt, left in a huff, and never came back. Apparently they had spent too much time talking to screen-writers and producers too. The City tried to put the Louisiana man on the job, but there was a problem in that he didn’t have liability insurance. After a little more checking, it turned out that he was a con-man, knew nothing about alligators, and there were several warrants out for his arrest. His fifteen minutes were over, too. Since then, Reggie has been living large in the lake, dining pretty well on carp, ducks, and sea gulls. There hasn’t been any more coverage of efforts to catch him, and as temperatures have cooled he is likely denned up somewhere in torpor. But Janice Hahn can’t let it go. She was in the middle of the press conference announcing the filing of charges against Reggie’s owner and one of his friends. She admitted that the City has spent $155,000 trying to catch Reggie. She can’t let go of Hollywood either – her latest brainstorm is negotiating with Steve Irwin, star of the Animal Planet cable channel show “The Crocodile Hunter,” to launch another attempt soon. A police officer in Fremont, CA was attacked by a pack of vicious chihuahuas while making an arrest. He was taken to the hospital, treated for ankle-bites, and released. William Howells, a giant in physical anthropology, has died at 97. He was a stalwart of the “second generation” of anthropologists in this country. Anthropology as a modern social science was founded in America by Franz Boas, a German immigrant, who established a department at Columbia University in the 1890s. He trained the first generation of anthropologists: Alfred Kroeber, Robert Lowie, Margaret Mead, Ruth Benedict, Fay-Cooper Cole, Leslie Spier, Elsie Clews Parsons, Ruth Bunzel etc and sent them around the country to colonize other universities and train more researchers. Howells was in the second wave. Howells made significant contributions in breaking down what had been conventional wisdom about racial differences. He wrote numerous standard works in physical anthropology, some of which were in use when I first got started. He had a long and productive career. 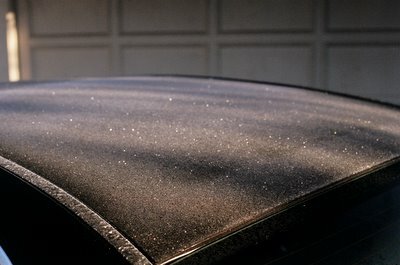 Here in Southern California seasonal changes are a lot more subtle than most of you are used to – certainly much more than I was growing up in Tennessee. I have joked to Steve and Matt that I sometimes have to check the latest Cabela’s catalog to see what season I’m in. One of the signs I have come to depend on that warm weather is over and cooler weather has arrived is when my gardenia bush stops blooming and my calla lillies grow back up and start. 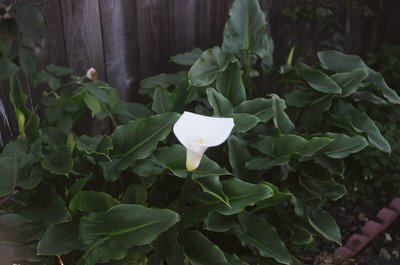 I went out in the early morning a couple of weeks ago to document my first calla of the season when I was surprised by something we rarely see here. Frost on the top of one of our cars. Shocking isn’t it? And here is that first calla, a much more reliable indicator of seasonal change than frost in my neighborhood. Gullah is a Creole English dialect spoken by the descendants of slaves in the Sea Islands of Georgia and in low coastal areas of Georgia and South Carolina. I remember learning about this dialect (called Gullah in South Carolina and Geechee in Georgia) when I took intro linguistics at Tulane. This tells the story of the recent completion of the translation of the Bible into Gullah. I have always found creole languages like Gullah and its counterparts in the British West Indies interesting with their African loan words and attempts to use the sentence word order of African languages with English words. The article gives some interesting examples. My sole personal experience with a Creole English was on a trip to Jamaica, where the locals refer to it as “The Patois.” It was absolutely incomprehensible to me. Having grown up in Memphis, I was intrigued by this account of historic archaeologists uncovering the remains of houses of prostitution off Beale Street there. These date from around 1900-1915, when Beale Street was a cultural and entertainment center for blacks in Memphis and the Mississippi Delta. It played a key role in the development of blues and jazz. W.C. Handy, “Father of the Blues”, lived and worked there and there is a city park with a statue honoring him nearby. A number of other historic archaeology projects have uncovered remains of houses of ill-repute from the late 19th and early 20th centuries and there are even specialists who study what they call Late Victorian “sporting culture.” The archaeologists find lots of liquor bottles, drug paraphernalia (especially syringes and opium pipes), and remains of medicine bottles and medical devices used to treat venereal diseases in those pre-antibiotic days. The first of these sites that I remember hearing about was the Vanoli Block excavated by Steven Baker in Ouray, a mining town in western Colorado. Today Beale Street has been cleaned up and gentrified as an entertainment district, with nice restaurants and night clubs. BB King owns a nightclub there. Reading the article, one is given the impression that after prohibition was enforced in 1915, that Beale Street’s days as a red-light district were largely over. Nothing could be further from the truth: it was a going concern well into the 1970s. Beginning in WWII, there has been a large military presence in Memphis from the Millington Naval Air Station north of town, and lots of sailors and marines ended up on Beale Street on the weekends. It was known as a dangerous part of town and most of us stayed away. A high school classmate of mine was murdered by a pimp there. I was also interested by the article’s references to the political power of E.H. Crump, who was the boss of a political machine that ran Memphis politics from his first term as mayor in 1910 until his death in 1954. Crump’s machine wasn’t as well known as the Dailey machine in Chicago or the Pendergast machine in Kansas City (that produced Harry Truman) but it was every bit as effective. Boss Crump was unusual in the Jim Crow era in that he respected and courted the African American community and allowed them a certain amount of autonomy. In contrast to most of the South, where blacks were actively disinfranchised, they were enrolled and allowed to vote in Memphis. In return for Crump’s support, black ward-heelers and church leaders turned out the vote for his candidates. Memphis was already the largest city in Tennessee, and its electoral weight was increased by its black voters, whose counterparts were kept from voting in the rest of the state. Boss Crump was the major player in Tennessee politics in the first half of the 20th century. Beale Street was the exception to Crump’s agenda, which was to make Memphis a “clean” city. I was a baby when Crump died, but the inertia of the government bureaucracry he formed continued long after his death. Memphis was always proud of being ranked as one of the cleanest (physically!) cities in the country and lots of attention was paid to street-sweeping and similar activity. You rarely saw homeless people – the police quickly hustled them out of town. Prohibition was of course, repealed, but its legacy continued in a series of baroque liquor laws that prevented restaurants from serving alcohol and kept bars from serving anything but beer. That didn’t get changed until the early 1970s. One of the yardsticks of the city’s virtue often cited in the newspapers was that “Memphis had more churches than service stations.” I don’t know that anyone tracks that statistic anymore. One of the best examples of this attitude was that Memphis had a board of censors from the 1920s til the 1950s that had to approve all movies. It’s hard to believe that Hollywood fare from this era was too racy for the general public, but the Memphis censors banned a large number of movies. The chairman and public face of the censor board was Lloyd Binford, who received accolades from religious leaders and was a figure of ridicule for the general public. The practical consequence of this was people drove 10 minutes to West Memphis, Arkansas where a number of theaters opened up and could see any movie they wanted. William Faulkner (a frequent visitor to Memphis) gained a measure of revenge in his novel The Reivers. Part of the novel is set (appropriately enough!) in a Memphis bordello, and Faulkner named its proprietor “Mr. Binford” as an inside joke for Memphians. Boss Crump’s machine mostly died with him, but machine politics is far from dead in Memphis. The African American community learned its lessons well from Crump, and after throwing off the shackles of Jim Crow built their own machine. Beginning with the election of Harold Ford Sr. to the Tennessee Senate in 1970, the Ford family has dominated Memphis politics. Harold Sr. won a seat in Congress in 1974 that he “passed” to his son Harold Jr. in 1996. The Fords have used the family funeral home business to network within the community. Now there are a series of Ford “family seats” on the Memphis City Council, Shelby County Commission, and Tennessee House and Senate. These have been passed around Harold Jr’s uncles and aunt: Edmund, Emmitt, James, John, Joseph and Ophelia. Harold Jr. is now making noises about running against Bill Frist for US Senate. It hasn’t all been easy for the Fords. Harold Sr. was indicted on bank fraud charges in 1987 and acquitted. Emmitt resigned from the Tennessee House after an insurance fraud conviction in 1981. This year John resigned his seat in the Tennessee Senate after indictments on bribery, extortion and witness intimidation. Ophelia was forced to run in a special election in September to protect John’s seat and won by 13 votes out of 8750 cast. But the more things change, the more they stay the same: turns out several of the votes in that 13 vote landslide were cast by dead people. You may recall a couple of weeks ago, I complained that most reports on climate in the mass media took too short a timeframe to be meaningful. Yesterday the New York Times finally produced one of very few articles I have ever seen in the popular press that does put current temperature data in a proper context. Well worth reading. Norman Vaughn passed away over the Christmas weekend. Vaughn did so much in Arctic and Antarctic exploration – back to the Byrd expeditons in the 1920s – it’s hard to believe he is gone at age 100. I mean you have to admire any man who completed six Iditarods after age 70! You can read more about his storied life here. 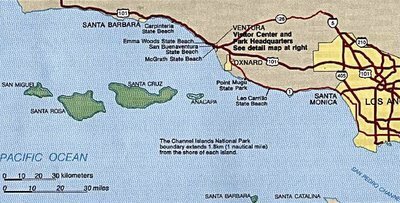 This year marks the 25th anniversary of the formation of Channel Islands National Park and the Los Angeles and Santa Barbara news media are carrying a number of pieces on issues related to the Park’s history and management. 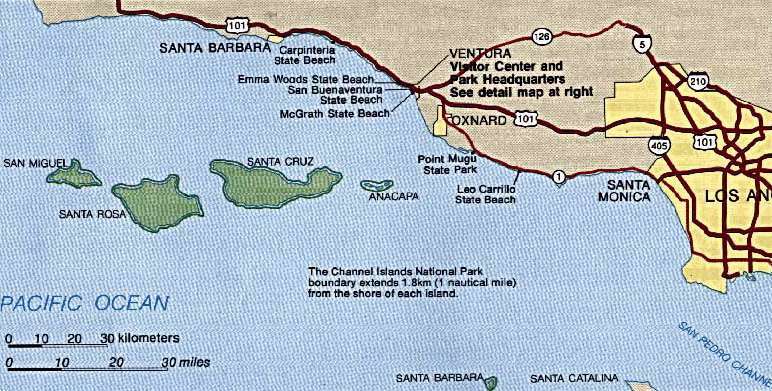 This is a fairly thoughtful article on Santa Rosa Island (see above map). The most discussed and controversial issues on all the islands relate to control and/or eradication of non-native species that are crowding out threatened and endangered natives. Black rats have been eradicated from Anacapa Island, we have posted here previously on the eradication of feral pigs on Santa Cruz Island, and deer and elk are slated to be eradicated from Santa Rosa by 2011, when the last private in-holding there shifts to Federal control. The Channel Islands have been called the American Galapagos and they are a true national treasure. They are also covered with well-preserved Chumash archaeological sites and the oldest burial known from North America (13,500 BP) was found at Arlington Springs on Santa Rosa. Santa Rosa is also home to most finds of the pygmy mammoth. This LA Times piece carries a paradoxical message: the reintroduction of the wolf into areas of Idaho, Wyoming, and Oregon has a been a raging success biologically, but this has come in the face of unremitting hostility from locals (see above bumper sticker). The wolf has been one of the success stories of the Endangered Species Act – but as this article points out, Federal officials are afraid to de-list the wolf for fear of what state and local governments would then do to exterminate them. The predation numbers carried in this article make it sound as though the Federal and state officials are talking past each other with emotion taking on science. That is becoming an old story here in the western states that have large areas of Federally-owned land. Local officials have an instinctive resentment of any Federal assertions of power in land management. But that’s probably the subject of another post. Please take a look at this. The LA Times has printed a correction. The press release from the governor of Wyoming saying that the ESA was not in force in his state quoted in the story has been revealed as an April Fool’s joke swallowed by the reporter.